LOCATION: Upper Mountain Research Station, Laurel Springs, NC. Growers western North Carolina (NC) now have a tool to enhance production of raspberries in the fall. We found that rowcovers applied to plots in the spring, advanced harvest of raspberry fruit 4 days to 2 weeks in western NC. This enabled harvest of high quality fruit prior to killing fall frosts. A new industry could be developed using rowcovers at various elevations for an extended fall harvest of raspberries in western NC. Raspberries are available nearly year round, yet the majority of the fruit is produced either in California or is imported from Mexico or other Latin American countries. Raspberries are a temperate fruit crop and are naturally adapted to growing in areas such as western NC during the summer and fall. However, most floricane fruiting raspberries do not tolerate the fluctuating winter temperature that can kill the canes of summer fruiting types. And, in higher elevations in the mountains, fall frosts kill flowers and fruit just as they are beginning to bear fruit. Studies in other regions of the U.S. have shown that rowcovers placed over the rows in early spring promote early growth in the crop and advance the ripening of the fall crop at least a week (Pritts et al. 1992). Previously, we determined that only 15% of nine different fall fruiting raspberry cultivars produced fruit at the Upper Mountain Research Station in Laurel Springs, NC prior to killing frosts. The planting in Laurel Springs was the ideal location for a row cover study, where the average date for a killing frost is Sept 15. Objective: The objective of this study is to determine if row covers can advance the ripening of a raspberry crop in the mountains prior to killing frosts. Nine raspberry selection or cultivars were used in this study, NC 451, NC 450, Heritage, Caroline, Anne, MBT-fl , Josephine, Deborah (ND-f1) and QEC-f1. Remay T-518 row covers were placed on half of the plots (2 reps) on March 19, 2004, just as new primocanes were beginning to emerge. Data loggers were set in plots under the rowcovers and in uncovered plots to monitor temperatures. Rowcovers were removed May 15, 2004. Yield components (total canes/plot, total buds, flowers and fruit /cane, total weight of fruit, plot yield, and fruit quality components (firmness, crumbliness, flavor and brix) were measured on a weekly basis. Rowcovers advanced primocane emergence (Photo 1) and fruit harvest with 7 of the nine cultivars in this study. Yields were estimated using the method described for estimating yields of raspberries in small research plots (Daubney et al 1986). Estimated yields were based on fruit set on 2 canes, was multiplied by the actual weight of 50 berries from that plot (Figure 1). Yield estimation showed that although total yield was not affected by presence of row cover, harvest began 4 days to 2 weeks earlier (Figure 2). Fruit firmness varied by cultivar, with Heritage, Anne, Josephine, and NC 450 being firmest (Figure 3). In general, firmer berries held up longer in coolers at the Laurel Spring station (data not shown). Cane lodging was significant with Caroline (photo 3). Although temperatures were monitored in this trial, we have been unable to download the data at this time. Figure 1. Yield estimation for one linear foot of row. Figure 2. Harvest period of nine cultivars with and without spring applied row covers. Figure 3. Fruit firmness at harvest, based on a scale of 0-100%. This is the average from two consecutive harvests. 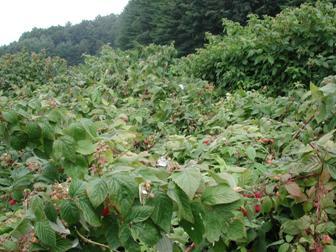 Rowcovers promote earlier fall harvest of raspberries in western NC. Growers in western NC should seek local and wholesale markets as possible outlets for locally grown raspberries. Wholesale prices of raspberries at the Altanta Terminal Market during the period of time this fruit was harvested (August and September 2004) ranged from $19.50-22.50/flat (12 6 oz. clamshells). The use of tunnels could extend the fall harvest and potential yield of the crop. Daubney H.A., A. Dale, G. McGregor. 1986. Estimating yields of red raspberries in small research plots. HortScience. 21:1216-1217. Pritts, M. E. Hanson, E., J. Fiola andM.J. Kelly. 1992. Rowcovers accelerate fruiting and increase productivity in primocane fruiting red raspberries. HortTechnology. 2: 46-51.